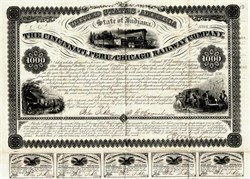 Beautifully engraved uncancelled certificate from the Cincinnati, Peru & Chicago Railway Company issued in 1855. This historic document has an ornate border around it with 3 vignettes of a train, foundry and farm. This item has the signatures of the Company’s President and Secretary and is over 150 years old. The Bond is also signed by E. M. Durham as Trustee. 31 coupons attached on bottom. 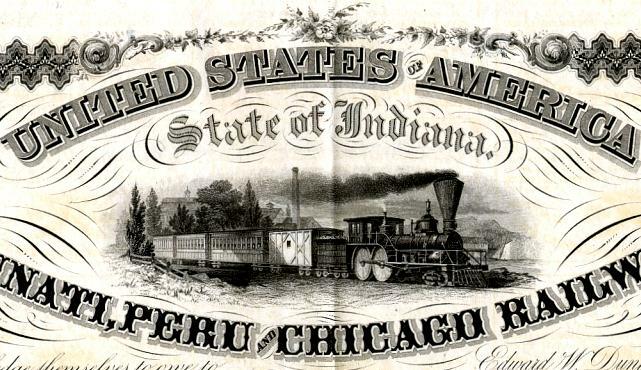 The Cincinnati, Peru & Chicago Railway Company was organized and authorized by their charter to construct a railroad from Laporte, in that State, by the way of Plymouth to Marion in the same State. The whole length of the railroad, as contemplated, was about ninety-seven miles, and for the purpose of constructing, completing, and equipping the entire route, the directors resolved to raise money by loans to an amount not exceeding $1,000,000, and to issue the bonds of the company, not exceeding one thousand in number, for the sum of $1000 each, payable in twenty years from date, and bearing interest not exceeding seven percent per annum. The company decided to construct the road by sections, and, with that view, divided the route into four parts, designated and numbered as sections one, two, three, and four. Section one extended from Laporte to Plymouth, a distance of about twenty-eight and a half miles: this was the only one that was built, and a lawsuit ended up in the U.S. Supreme Court DUNHAM v. CINCINNATI, P. & C.R. CO., 68 U.S. 254 (1863). DUNHAN was the Trustee of the Company. DUNHAM v. THE CINCINNATI, PERU, &C., RAILWAY COMPANY. unable to complete the road, he, the respondent, on the 28th of November, 1855, entered into an agreement with them to complete the first section and furnish all the materials, and that the company agreed to pay him the full value of the materials so furnished, and a reasonable compensation for his services; that, as part of the arrangement, the company engaged to deliver to him, from time to time, ninety-nine of the first mortgage bonds, and two hundred and ninety-nine of the second mortgage bonds, at $400 for each $1000 bond, and that he, the contractor, was to have and keep possession and control of that section of the road and its earnings until the company should make full payment to him of what they should owe him under that agreement. The answer then averred that he expended for materials and labor in completing the contract, $302,000, and that the company, on the 8th of April, 1858, confessed a judgment in his favor for the balance due him under the contract, amounting to $129,491 43/100, which, as he insisted, was entitled to a preference in payment from the earnings and income of the road, and from the proceeds of the sale of the same over the first mortgage bonds. 1st. To pay the expenses of operating the road. 2d. To reimburse himself for all the money which he might advance. 3d. To pay the interest on the first and second mortgage bonds, and if there was any surplus, to apply the same to the other objects therein specified. The answer of the other respondent, Ludlow, set up the same defence. The mortgage of the complainants had been duly registered, March 9, 1855, more than eight months before the contract was made with Walker and Ludlow. costs, should be paid over to Ludlow, as assignee of the contractor, to the exclusion of the trustee, and in preference to the mortgage on which the suit was founded. From this decree, Dunham, a creditor under the mortgagee, appealed, and now sought to reverse the decree. 1. The question is, whether Walker-having made the road by the expenditure of his own means, without which expenditure the road was worthless to the company and the bondholders, and made it under a written agreement with the company that he should retain possession of the road, and apply its earnings to the liquidation of the debt due him, until such debt was paid; and having never surrendered possession to the company- holds a prior lien upon it, and is entitled in equity to a priority in the distribution of the proceeds on sale of it? We think that he is. I. Railroad mortgages made to secure the payment of bonds which are sold for the purpose of obtaining means with which to construct the road, are different from mortgages on land, to secure money borrowed. In the latter the security is in esse, and belongs to the party making the mortgage; in the former, the road, which is the only security, is not in existence and does not belong to the mortgagor, but on the faith that the company will in future construct it, the bonds are purchased. McLean, J., further held that T., B. & Co., by keeping the bridge in their possession, preserved a lien on it for their compensation. It is said that the assent of the trustee or bondholders to Walker's contract with the company was necessary to make it valid against them. The answer is, that if such assent was necessary, the court will presume it, under the circumstances presented in the case. The construction of the road was the primary object of the organization of the company. It was the purpose for which the bonds were sold, and the agreement was made with Walker. The bondholders and stockholders were the only persons personally interested in making the road. The road being the only security which the bondholders had for the payment of the bonds, they were more deeply interested in the construction than the stockholders. The right of way or right to the land, afforded them no security. The construction of the road was under the control and management of the company, who alone had to provide the means for its construction, and who alone, in its construction, represented the interest of every one concerned. The company was the agent or minister of the trustee, bondholders and stockholders, in the construction; and it was their duty to employ all available resources over which they were competent to exercise control, to prosecute it to completion. This authority may fairly be held to extend to everything which was necessary to the further construction of the road, and which was in no sense prejudicial to the interest of the bondholders. Repeated adjudications have affirmed, on general principles, the validity of such a mortgage by a railroad company against subsequent creditors and incumbrancers with notice. Pennock v. Coe,14 in this court, may be said to be in point. The mortgage was executed in pursuance of a power conferred upon the company, and its validity is not drawn in question by the pleadings. It is not alleged that the complainant consented to the arrangement in regard to the road for which the contract with Walker provided. That contract was later in date than the mortgage. Walker had full notice of the latter. His title to the possession of the mortgaged property or to the proceeds of the sale thereof cannot, therefore, be enforced so as to displace the prior and paramount lien of the mortgage, or to impair or postpone any of the rights or equities created thereby or arising therefrom. Counsel on the other side insist that the consent of the complainant should be presumed, if such consent be necessary to the maintenance of Walker's contract. But the court will not presume that a party, whose rights were secured by a valid mortgage duly recorded, consented to waive them, nor that a fact existed, where there is no averment thereof in the record. If Walker relied upon such consent, he should have alleged and proved it. The doctrine that fixtures attached to the soil at the time of the execution of a mortgage or subsequently acquired, will pass by it, is not controverted on the other side, but its applicability to this case is denied upon the assumption that the company had but a right of way and no title to the land. That assumption, if supported by the facts, would not affect the complainant's rights, but the mortgage does convey, in express terms, 'their road built and to be built in the State of Indiana, including the right of way, and the land occupied thereby, together, &c., & c.' The court will presume that the company had the property which it mortgaged, and Walker's answer does not set up the company's non-ownership of the land, in avoidance of the mortgage. Neither of the two cases cited on the other side are authorities in this court. We think that the case from Georgia went in a large degree on the construction of a local statute. The one decided by McLean, J., is more in point; but it is a circuit case, and of course not binding here. As the case was never published by that judge during his lifetime, being now brought out from his MSS., it would seem that he was not absolutely sure, on reflection, how correctly he had decided it. Pennock v. Coe, as we have already said, is an authority, being in this court. 2. The decree of the court below gives precedence in payment to the past due coupons, over the principal of the bonds. This was in violation of a clear provision of the mortgage, in case a default be made in the payment of the principal or interest. 1. Appellant contends that the proceeds of the sale of the road, after paying the costs of suit, should be ratably applied towards the payment of the first mortgage bonds and the overdue interest warrants under the same, instead of being applied, as directed in the decree, to the payment of the judgment in favor of the contractor, and to the overdue interest warrants, to the exclusion of the principal of the bonds. Appellees insist that inasmuch as the contractor completed the road by the expenditure of his own means, under a written agreement with the company, purporting to secure to him the possession of the road and its earnings, he has a right to retain the same, and that the proceeds of the sale should be applied to the liquidation of the indebtedness of the company to him until the same is fully discharged. to sustain that proposition, chiefly upon two grounds. 1st. It is insisted that the mortgage to the complainant, as trustee for the benefit of the bondholders, does not hold any part of the road except what was built at the time the mortgage was executed and delivered. 2dly. They contend that a contractor, expending money and labor in building a railroad, as in this case, under an agreement with the company that he shall have the possession of the road until he is fully paid, thereby acquires a priority over an elder valid mortgage. authorize them to mortgage it for that purpose. Authorized as this mortgage was by express statute, the case is even stronger than that of Pennock et al. v. Coe (23 Howard, 128), where the rights of the parties depended upon the general rules of law. Terms of the grant in that case were, 'all present and future to be acquired property,' and yet this court held, in a controversy between the grantees of a first mortgage and the grantees of a second mortgage, that the first took the future acquired property, although the property itself was not in existence at the time the first mortgage was executed. While enforcing the rule there laid down, this court said there are many cases in this country confirming the doctrine, and which have led to the practice extensively of giving that sort of security, especially in railroad and other similar great and important enterprises of the day. Several cases were cited by the court on that occasion, which fully support the position, and many more might be added, but it is unnecessary to refer to them, as the one cited is decisive of the point. 2 Story Eq. Jur. (8th ed. ), 1040-1040 a.
the agreement that he took the road subject to the rights of the bondholders. Acting as he did with a full knowledge of all the circumstances, he has no right to complain if his agreement is less remunerative than it would have been if the bondholders had joined with the company in making the contract. No effort appears to have been made to induce them to become a party to the agreement, and it is now too late to remedy the oversight. Conceding the general rules of law to be as here laid down, still an attempt is made by the respondents to maintain that railroad mortgages made to secure the payment of bonds issued for the purpose of realizing means with which to construct the road, stand upon a different footing from the ordinary mortgages to which such general rules of law are usually applied. Authorities are cited which seem to favor the supposed distinction, and the argument in support of it was enforced at the bar with great power of illustration, but suffice it to say, that in the view of this court the argument is not sound, and we think that the weight of judicial determination is greatly the other way. Pierce v. Emery (32 N. H., 484); Pennock v. Coe (23 How., 130); Field v. The Mayor of N. Y. (2 Seld. 179); Seymour v. Can. and Niag. Falls Railroad Company (25 Barb., 286); Red. on Railways, 578; Langton v. Horton (1 Hare Ch. R., 549); Matter of Howe (1 Paige, 129); Winslow v. Mitchell (2 Story, C. C., 644); Domat, 649, art. 5; 1 Pow. on Mort. 190; Noel v. Burley (3 Simons, 103). the mortgage, where it is said that in no case shall the principal of any bond be considered due until twenty years after its date; but it is quite obvious, we think, that the latter clause was inserted merely to exclude any possible inference that a bondholder under any circumstances might bring an action for the principal of a bond before it became due by its terms. Such was, doubtless, the intention of the provision, but it does not in any manner conflict with the suggestion already made, that in case of sale on account of default of payment of interest or principal, that all the bonds of the same class, and the interest accrued thereon, shall be entitled to a pro rata dividend of the proceeds. The decree of the Circuit Court is, therefore, reversed, with costs, and the cause remanded for further proceedings, in conformity with the opinion of this court. Footnotes Footnote 1 Act of May 11, 1852, 19; 2 Revised Code, 409. Footnote 2 Redfield, 124, 125. Footnote 3 The State v. The Mexican Gulf R. R., 3 Robinson, 514. Footnote 4 4 American Law Magazine, Jan., 1845, p. 278. Footnote 5 Seymour v. C. & N. R. R., 25 Barbour, 301; Pierce v. Emery and cases cited, 32 New Hampshire, 505. Footnote 6 1 Kelly, 457. Footnote 7 See Redfield, 574, part 8, for the principle which he deduces from the decision. Footnote 8 MS. report, in possession of a son of McLean, J.
Footnote 9 Mott v. Palmer, 1 Comstock, 564. Footnote 10 Godard v. Gould, 14 Barbour, 662. Footnote 11 Ford v. Cobb, 20 New York, 344. Footnote 12 Haven v. Emery, 33 New Hampshire, 66. Footnote 13 Pierce v. Emery, 32 New Hampshire, 484; Pettingill v. Evans, 5 Id., 54; Pennock v. Coe, 23 Howard, 117. Footnote 14 23 Howard, 117.